The Seventeenth Patriarch LuJing-Gong Patriarch The first patriarch of the White Sun era, Patriarch Lu, first name Zhong-Yi, was born on April 24,1849, in Jining, Shantong Province of China. In his childhood, Patriarch Lu lost his parents and lived in poverty. He joined the army at the age of 22, miraculously inspired by the Buddhas to receive Tao from the sixteenth Patriarch Liu. He donated all his savings sincerely, and followed the sixteenth Patriarch Liu to cultivate the great Tao and experienced hardships and toils with sincerity. In this way, he accumulated infinite merits. As Patriarch Liu was nearing the end of his mortal life, he begged for instructions from the Almighty God asking who could continue the heritage of Tao. In 1905, Lao Mu (the Almighty) ordained Patriarch Lu as the seventeenth patriarch, or the first patriarch of the White Sun era. With the Heavenly Decree from the Almighty, Patriarch Lu propagated Tao in Jining, Shantong Province of China. This started the Last Salvation Mission. 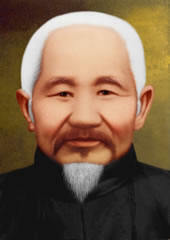 Patriarch Lu passed away with white hair and a reddish baby-like face at the age of 76 on February 2, 1925. On March 3 of the following year, the Holy Spirit of Patriarch Lu worked a great miracle by borrowing the physical body of a person named Yang Chuen-Ling. This miraculous act lasted for one hundred days, during which he chanted the Jing-Gong Subtle Scripture and the True Sutra of Maitreya Buddha. Both are now widely spread in the world.